pitching in to do whatever is needed, I was not doing this for the right reason–to help the games come off as a success. I decided to change my mindset and commit to the driver experience. I really must thank my family and my employer GrantBook for also supporting my volunteer commitments. My schedule had 11 shifts of 10-hours each through the duration of the games, which necessarily meant making temporary adjustments to established routines and schedules. My family pretended to moan and complain, but I think they were proud to support me. As for my work, I had already committed to volunteer prior to going through the recruiting process at GrantBook, so I was nervous about whether they would be willing to make concessions to this schedule. I didn’t need fear, they were so supportive and willing to work around my schedule. It was so great to confirm the values of volunteerism and community engagement they spouted during the interview process wasn’t just talk. 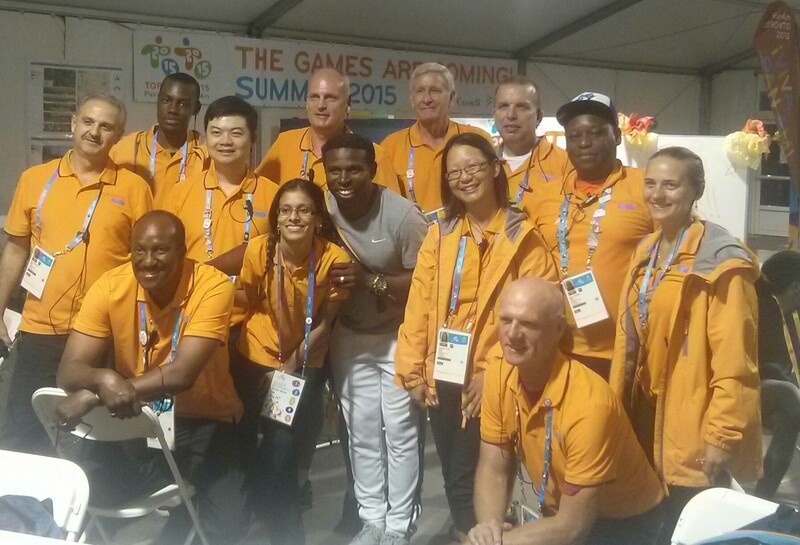 In the end, I got a tremendous satisfaction in knowing that in my small manner, I helped contribute towards pulling off an extremely successful Pan Am Games. It was a palpable energy from everyone, especially when the mood of the city changed from grumbling about the expected traffic issues to one celebrating the success of the athletes and the legacy of the games, both sporting and artistic. Especially that “TORONTO” sign installed at Nathan Phillips Square. I had a great time talking with the other volunteers who came from all across the region. There aren’t very many situations living in this large city where it’s easy to start a conversation with anyone based purely on the shared circumstance that you’re in. The common volunteer experience was an easy way to start conversation with anyone wearing the bright orange (or rather, marigold) shirt. “Control, control, this is Charlie 946, radio check.” Having the radio and ear piece, and using the radio lingo was actually kind of entertaining and an indelible part of the volunteer driver experience. The other indelible driver experience: staging the car at Cooper Street during the shift assignment at the Weston Hotel (WES), because there were invariably 30 to 40 cars assigned to this location. Spending more time driving the tedious circle route to Lower Jarvis, Lakeshore, Bay, and finally Queen’s Quay eastbound to move to Staging areas 2 and 1, than actually driving clients. But at least there were lots of other volunteers to chat with and share stories. Having the voice of radio control in my ear, providing a calm and reassuring (and sometimes entertaining) presence through the shift. Driving in the Games HOV lanes! Meeting Michael “Pinball” Clemons at 1am in the depot. Even though he’d been out visiting the different venues and locations all day, he was still so patient and friendly and warm with us volunteers. He made sure to thank every one of us for volunteering our time to the games. He was willing to take a picture with anyone and everyone who asked, and took the time to chat with everyone. He’s really a world-class human being, Toronto is so lucky to have him. Losing my Contingo coffee mug in the Pan Am vehicle that shuttled me from Union to the depot my first volunteer shift, and forgetting both the driver’s name and his car number. I despaired the whole day (i only had the mug for a few weeks!). After my shift, I went to the sign-in desk to inquire about a lost and found, when-voila!-the same driver also came by to drop off the mug. I made a new friend, and discovered he’s also from my neighbourhood! He then offered to carpool with me on those early morning 6am shifts that we had in common. What a guy. Thanks Ron! Having good laughs on this one shift at the Athlete’s Village on the second-last day of the games with Ron, Dave, and others. One of our busiest, and one of the hottest days. (“You make me hot just looking at you.”) Raising our collective eyebrows at “Grumpy guy”. Enjoying the more relaxed protocol where we started being able to drive athletes around. Driving the Consul General for Colombia (I think he’s like a minister of sport?) to the airport to pick up his brother. Trying to wrack my brain for what I knew about the country that did not involve drugs. Especially when he said his home town was Medellin. I think he was impressed – he ended up giving me a pin and his card. “Call me if you’re ever in Colombia!”. The Canadian men’s sabre fencing double-silver medalist from the Athletes’ Village to his press conference. It was so great to hear how the experience was for him, being a once-in-a-lifetime opportunity to compete on home soil, in front of large crowds that were cheering for him. 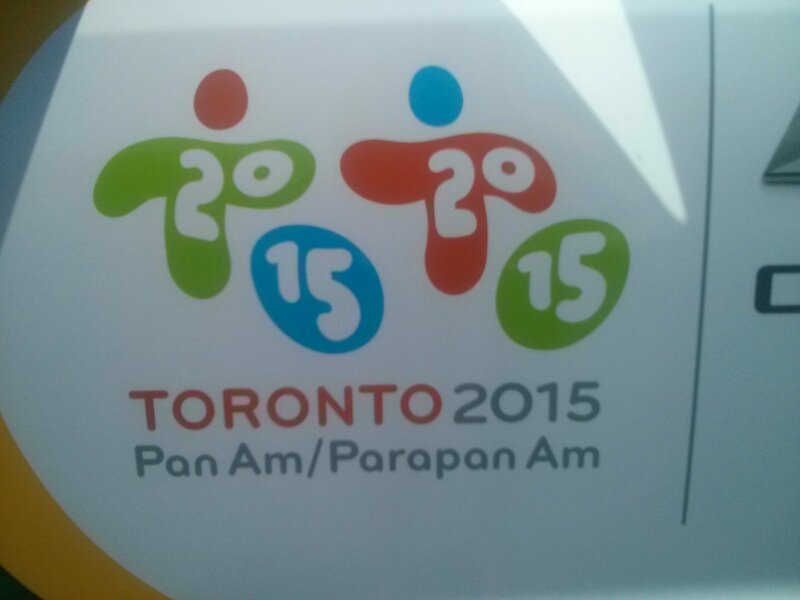 A visually-impaired Brazilian goalball athlete and his guide to the venue in Mississauga. I didn’t know about goalball! A Cuban team official who didn’t speak any English to the PanAm Aquatic Centre in the failed attempt to find an athlete’s forgotten team jacket. A medical official who is on the team responsible for verifying and vetting submitted exceptions to banned medication. Found out lots about the process to test for ways athletes may attempt to mask doping or other performance-enhancing activities. An NBC media person who was so complementary about the games, even though she did not have an opportunity to see any of Toronto outside of the village, York University, and the Distillery District. A car full of Venezuelan athletes to Chinatown for sight-seeing on the day of the closing ceremonies. A IAAF politician from Bahamas who explained some of the ins-and-outs about the politics behind the organization, as the IAAF was undergoing elections during the upcoming world championships.